So you want to start using Twitter's Promoted Tweets, huh? You've weighed the pros and cons, and decided that experimenting with Twitter's PPC advertising feature is a good move for your business. Alright then -- let's get you started with this simple guide containing everything you need to know to make the most of your Twitter PPC campaign. Whether you're just looking for more followers or you want to increase leads and customers, Twitter has some great paid options that can help you complement your organic Twitter marketing efforts. How Do Twitter's Advertising Options Work? 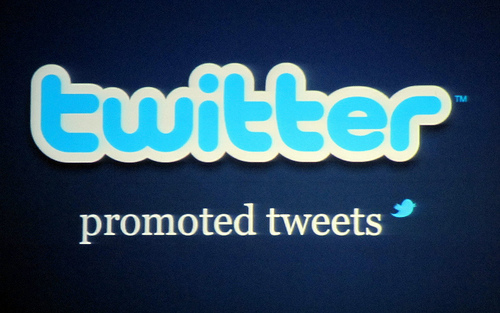 Promoted Accounts, Promoted Tweets, and Promoted Trends are Twitter's advertising features, pay-per-click style. Through its various options, Twitter allows you to target the right people so your ads are appearing for Twitter users who are most likely to be interested in your content, products, or services. Your promoted Twitter content will be labeled as 'Promoted,' so users are able to distinguish between promoted ads and organic Twitter content. Twitter advertising can also be a less expensive PPC option than major search engines such as Google. In other words, you can generate great results with a smaller budget. On the other hand, Twitter's ad interface also leaves something to be desired (remember how we mentioned pros and cons?). It's not as easy to use as Google AdWords, and you can't set up automatic rules to change your bids. For example, if you don’t want your tweets to be displayed on weekends or after 10 p.m., you need to manually log in to your account and change your options. That's why it's so important to make sure you're always aware of the activity in your Promoted account and make changes accordingly so you're not wasting your ad spend. That being said, setting up a campaign is easy, as long as you know what you are looking for. First, you need to decide what you want to do with your campaign. In other words, what is your end goal for using Twitter advertising? I want to promote my account! The Promoted Accounts option allows you to promote your brand name and will help you increase the number of followers your account has. You may be asking, "Why would I want to pay for more followers?" Good question! 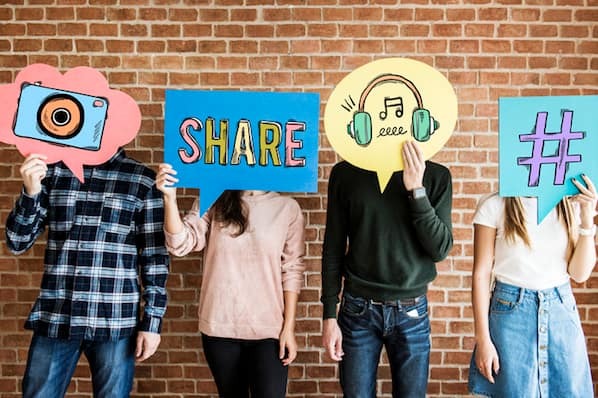 In a nutshell, having a larger base of Twitter followers is critical for maximizing the benefits of your social media marketing. The more followers you have, the more people will be exposed to your tweets. Furthermore, your followers also have their own followers who will see any of your content your followers retweet. And trust us, the greater your social media reach, the more effective your social media marketing -- even if those people never buy from you. Finally, the more followers you have, the more credibility and authority your account will exude. If potential new followers see that a larger number of people are already following your brand on Twitter, they'll be that much more likely to follow you, too. Ahh, the power of social proof! Promoted Accounts are displayed (1) as part of the 'Who to Follow' widget on the left side of a user's logged-in Twitter.com homepage and Connect tab, (2) on the 'Who to Follow' page, which users can access by clicking on 'View all' on the 'Who to Follow' widget or tab, (3) in 'People' search results, and (4) on users' profile pages as part of the 'Similar to you' widget. 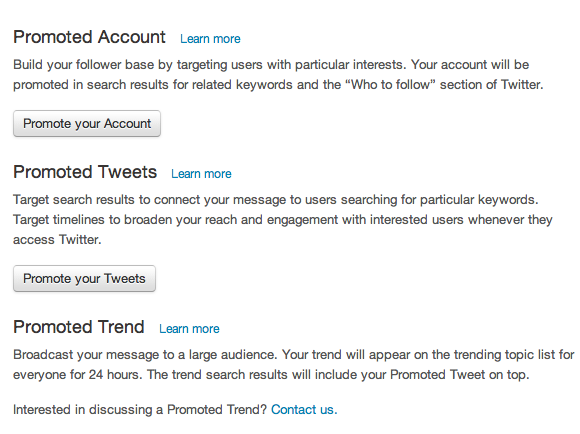 A user may see your Promoted Account as a suggestion if your account is relevant to them. I want to promote my tweets! If you want to promote a specific tweet that came from your company’s Twitter account, Twitter gives you have a few options through Promoted Tweets. For example, you might want to get more exposure for a tweet about a specific marketing campaign or offer you're currently promoting. Or perhaps you'd like to put some additional Twitter muscle behind an upcoming event your hosting. Promoted Tweets are visible (1) at the top of relevant search results pages, (2) within search results for a Promoted Trend, (3) in users' Twitter feeds, when relevant, (4) in pinned tweets for 'Enhanced' profile pages, (4) in Twitter's official desktop and mobile clients (e.g. TweetDeck, Twitter for iPhone, Twitter for Android, etc. ), (5) and in some third-party twitter clients, such as HootSuite. I want to promote a trend! 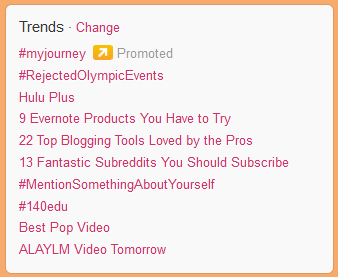 If you're interested in promoting a particular trending topic, you can contact Twitter to purchase a Promoted Trend. This is a way to get your name to a lot of Twitter users, but beware -- it's costly! To take advantage of this option, you will need to contact Twitter directly and inquire about your options. Promoted Trends are visible to all Twitter users at the top of the Trending Topics list on Twitter -- as well as on Twitter for iPhone, Twitter for Android, and TweetDeck -- and they're clearly marked as 'Promoted.' 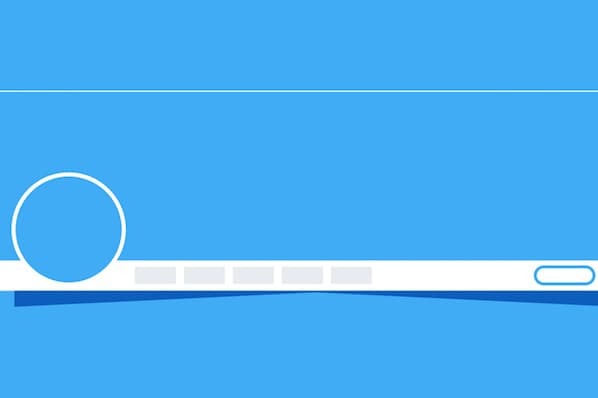 When a user clicks on a Promoted Trend, they'll see Twitter search results for that topic accompanied by a related Promoted Tweet from the advertiser at the top. Now that you understand your various options, let's dive into Promoted Accounts and Promoted Tweets individually so you can understand how to leverage each to achieve your specific goals. On Twitter, get started here. Promoting an account is very simple. Simply indicate the 'interests' of users you want to target. In other words, think about the keywords that are relevant to your business and content. Your account will automatically be recommended to people who have those interests. Again, using Promoted Accounts is most beneficial to drive traffic to your Twitter account and increase your follower count. You can then set your budget and timing. See "Dates and Budget" below for more details. You have three separate targeting options for your Promote Tweets: search results, timelines (users' Twitter homepage feed), and your own Twitter profile. When Twitter users search for a particular keyword, the tweet you chose to promote will appear at the top. This is just like Google AdWords -- whoever is the highest bidder for a certain term will appear at the top. Here, you can select as many keywords as you wish. With this targeting option, your promoted tweet will appear in the timelines of the followers you want to target. You have the option of targeting the timelines of 'Your followers' and/or 'Users like your followers.' The latter are users with similar interests to your followers. This option will pin your Promoted Tweet at the top of your account's profile page, visible to anyone who visits your page. This targeting option is beneficial if you're trying to drive visitors to your page off of Twitter and onto a page on your website. For example, at HubSpot, we might use this targeting option to promote an upcoming webinar at the top of our profile, which can serve to increase awareness of the event and drive traffic to the landing page on our site where users can register to attend. Once you've chosen the type of Promoted Tweets campaign you want to run, you can also change your settings and modify your target audience to get the most out of your campaign. You can then decide which devices you'd like your Promoted Tweet to appear on. Remember, if you're promoting on mobile devices, make sure any links in your tweets lead to mobile-optimized web pages. You don’t want to upset potential customers with a difficult-to-use website! 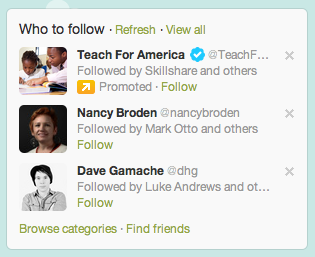 Now that you've specified your targeting preferences, you can decide which tweets you want to promote. You can either promote tweets you've already published or create new ones within the ads interface. 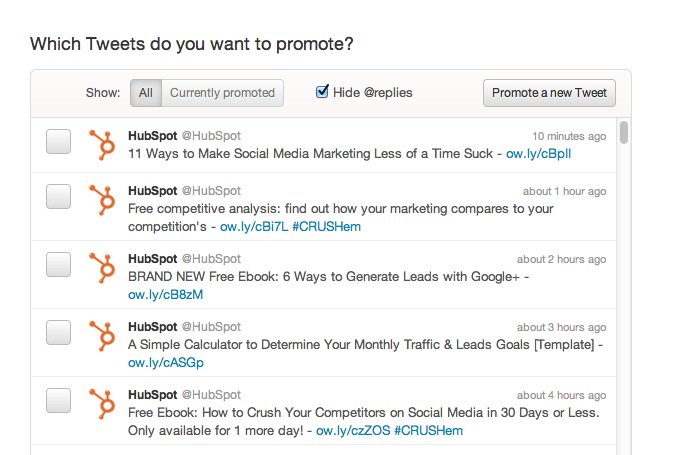 You can also choose more than one tweet for each campaign to add some variety to your Promoted Tweets. Lead Generation Offers: If you're looking to generate leads from your campaign, promote tweets for offer(s), and include links to landing pages on your site. 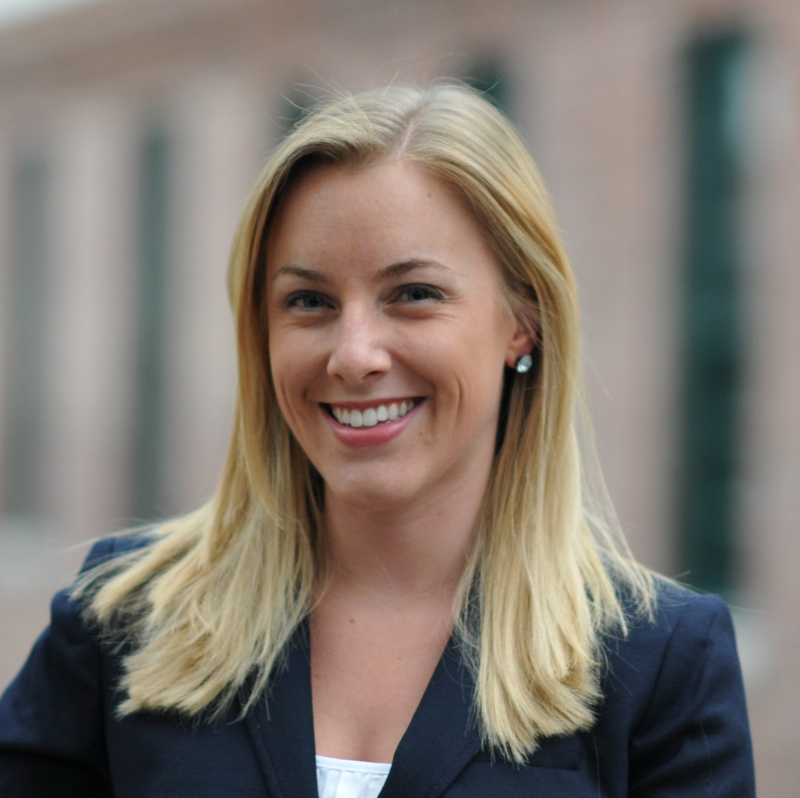 At HubSpot, we often promote our ebooks and webinar landing pages in our Promoted Tweets. Events: Got an event coming up right around the corner? Promote a tweet about the event your company is hosting or attending, and include a link to the registration page. Compelling Content: Do you want more people to read your blog or regard you as an expert in your industry? Use Promote Tweets to increase the reach of tweets touting particularly awesome content, especially considering the life of a non-promoted tweet is so short! One of the final things you'll need to do is decide on the length of your campaign. Your Promoted campaigns can either be ongoing, or you can choose to run them for just few days surrounding a big event or campaign. You'll also need to set your campaign's daily budget, which can be adjusted according to your needs. Twitter will never exceed your daily budget, and both the duration and budget of your campaign can be changed at any time when your campaign is running. Remember, Twitter's advertising is priced on a Cost-Per-Engagement (CPE) basis, so you only pay when someone retweets, replies to, clicks, or favorites your Promoted Tweet. You can also set a maximum bid, which is the maximum amount you're willing to pay per engagement (whenever a user clicks, retweets, @replies to, or favorites a tweet). Twitter will suggest a bid based on your daily budget, but the actual bid may vary throughout the day. Congrats! You're now ready to launch your campaign! Be sure to track the results of your Promoted campaigns -- you can easily monitor the daily spend of each campaign in the Twitter ads interface. For a more in-depth look at which campaigns and tweets are performing the best, you can look in Twitter's Ads Analytics for your account. Regularly check the status of your campaigns and make any necessary changes to ensure you're getting the most out of your Twitter advertising efforts. In addition to Twitter's own analytics platform, use your marketing analytics to determine how your Twitter advertising efforts are contributng to leads and customers as well. 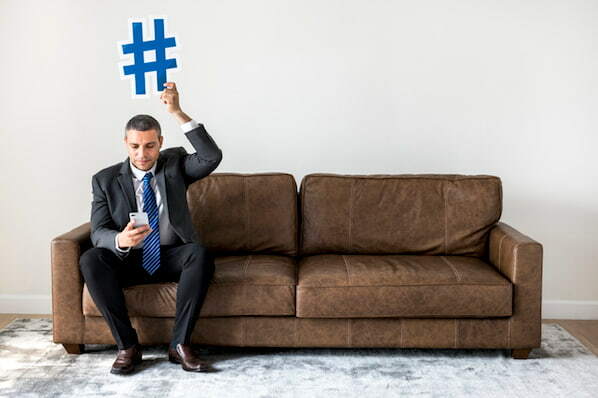 Be sure you're updating the tweets you're promoting often to keep your promotions fresh, engaging, and reflective of your overarching social media marketing goals. Are your tweets generating the results you want? If not, make some changes. Every business is different, and you'll need to do some testing experimentation to see what works best for your company. And if Twitter advertising turns out to be a subpar tool for meeting your goals, turn it off and trying something else. Now you know. Good luck! Have you experimented with Twitter's advertising options? What other tips for running successful campaigns would you share?